Blondie and Brownie: Three More Weeks of New Amsterdam! During this year's Foodbuzz Festival, Foodzie made an appearance at the Tasting Pavilion to highlight the focus of their site and some of the products offered. Foodzie is an online food marketplace for small-scale food vendors, for a wide-range of products. Prior to meeting them, I had heard of them in passing, but now I'm totally hooked! Especially because I was turned onto one of New Amsterdam's vendors! Over the past year, I've gotten a little more than addicted to maple syrup. I put it in everything including Greek yogurt. So when I saw Ledgenear Farm's Maple Syrup, I took a sample. Their Grade A Medium Amber Syrup was unbelievable in terms of sweetness and maple taste-as close to the most perfect syrup I've tasted recently. I made a mental note that they were also selling at New Amsterdam, and knew I had to stop by soon. When I did get the chance to pick some up, they let me know that though this Sunday, the 5th will be their last for year, next year they'll hopefully have Grade B! 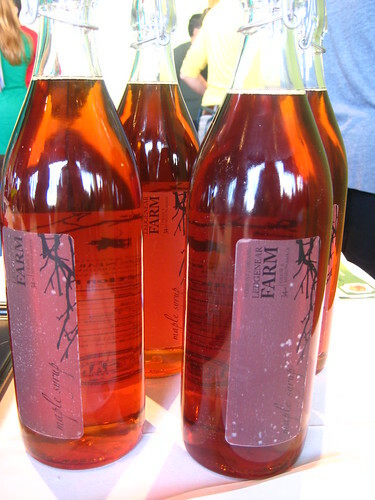 The darker color means more maple flavor, and most use it primarily for baking-I could drink it with a straw. 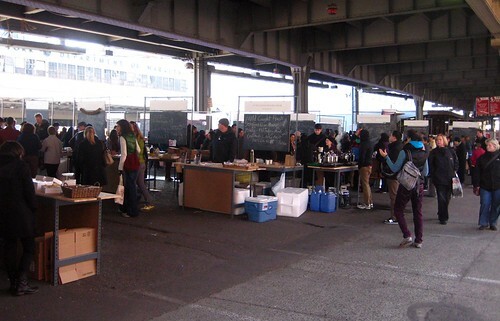 As for New Amsterdam Market, they have three more weeks of selling this year. This weekend is Winemakers and Accordians!